I don’t mean I don’t want you to. I don’t mean it’s not proper to. I mean it’s not possible to. This is for the same reason that I haven’t just broken one off three times, at the ends of the three preceding sentences. The English infinitive is one word. Not two. The to is not part of it. 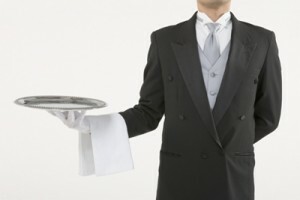 It’s just the infinitive’s trusty butler, and sometimes the infinitive doesn’t need the butler. When it does need the butler, it doesn’t need it right next to it all the time. And sometimes the butler stands in its place. It seems rather posh, doesn’t it, for an infinitive to even have a butler? It wasn’t always thus. In Old English — that Germanic language that was taking root as of the AD 600s, brought over by the Angles and Saxons — the standard infinitive was one word, for instance etan (eat). “Then the woman saw that the tree was good to eat.” That is, good for eating. Generally the inflected infinitive was used in places where a noun (e.g., gerund) construction was equally usable: begin to work could also be begin working; the power to kill could also be the power of killing; to speak is a sin could also be speaking is a sin. Obviously those instances have persisted, since my examples are in modern English. Something happened in-between the Old English period and now, though: English lost almost all of its inflectional affixes. The spelling and pronunciation changed some, too. So instead of ic ete, þu etst, he eteð, we etað, ge etað, hie etað, infinitive etan, subjunctive ete and eten, imperative ete and inflected infinitive (to) etenne, we now have I eat, (thou eatest), he eats, we eat, you eat, they eat, infinitive eat, subjunctive eat, imperative eat and (no longer inflected) to-infinitive (to) eat. All the affixes got eaten and just a little s is left. One result is that the to-infinitive is now used a bit more widely than it was in Old English, since there are places where it wouldn’t be clear if it were just plain old eat. But the pattern is largely similar: we use to when the infinitive is the focus of purpose or necessity (want to eat, need to eat), completes the sense of a verb or noun (begin to eat, the power to eat), or is the subject or object of a sentence (to eat would be nice). We use the bare infinitive when it follows certain auxiliaries of mood and tense (you must eat), verbs of causing (I’ll make you eat), verbs of perception (I want to see you eat) and a few others in that general vein. And we can snap off the infinitive and leave it implied; we don’t have to say it if we don’t want to. (Want to what? Say it, of course.) In fact, the to generally tends to stay more readily with what’s before it than with the infinitive it’s serving. Well, that is how a butler treats guests. He has to watch them to make sure they don’t get lost or steal the silver.